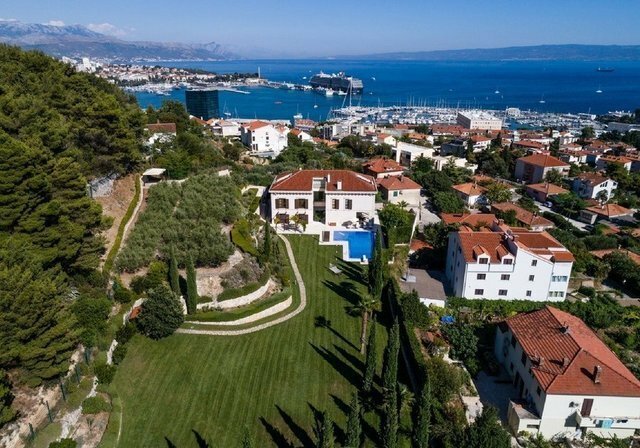 A luxury urban villa with a spectacular view of the city of Split and the Diocletian's Palace, as well as the open sea and the nearby islands. The gross living area of Villa Incantesimo stands at 900 square meters and it is situated on a plot of land covering an area of 4,200 square meters. Although it is located very near the old town and the Diocletian’s Palace, this modern villa enables a luxury lifestyle with all the programmes being provided in the immediate vicinity, whilst simultaneously offering full privacy due to its isolated location in the immediate vicinity of Marjan Park Forest. Villa Luxe comprises of four storeys and it includes a basement with a garage and a garden with a swimming pool of 60 square meters. In the basement storey with a floor plan covering 260 square meters, in addition to the garage of 65 square meters, there are premises intended for socialising and a gym with a bathroom. On the ground floor there is a spacious kitchen equipped with the latest appliances and a comfortable living room with a guest bathroom. On the first floor there are three extremely spacious bedrooms with private bathrooms. In the attic there is a large living room and a bathroom. Villa Luxe meets the requirements of a four-member family and, due to its spaciousness and the comfort it provides, it can be adapted to meet also other types of requirements. In addition to the spacious living area provided, the villa also has a huge yard bordering with the green zone of Marjan Park Forest.